“Assassinator” was born on June 12,1986. Her father was the 4x winner, Jacobs and Hicks’ “Assassin 1”. “Assassin 1” won his four matches in dominating fashion. He didn’t have an overly hard mouth, but he had the speed and ability to beat his opponent to almost every hold and to out wrestle them once he got there. He could make his opponents look so bad that their handlers would end up thinking their dog was sick or not “Right” that particular day. His brother the 8x winner “Assassin 2” shared these traits. In “Assassin 1’s” fifth match he competed against a dog that was considered an Ace by all who had seen him. 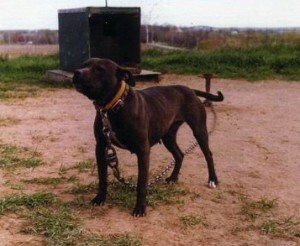 Goodtimes’ “Spike” had won over two good dogs in the mid-west in very impressive fashion. His father was the famous Ch.”Jeep” R.O.M. 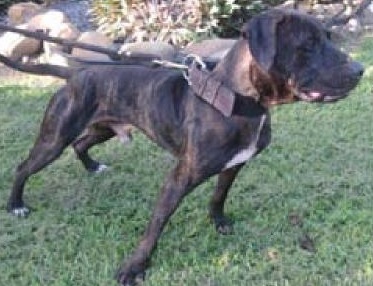 and his mother was Goodtimes’ Ch.”Sheena”. This turned out to be one of the best matches of all time, for the first hour “Spike” took more than very few dogs could withstand, and then turned it around and at the two and a half hour mark, “Assassin 1’s” handler asked for a scratch to continue. “Assassin” ran a falling crawling scratch that most there considered one of the GAMEST they had ever witnessed! At about the three-hour mark, “Assassin 1” was nearly finished and “Spike” was asked to scratch to win. He completed his scratch but before he did his handler stepped out of his corner. The foul was granted by the referee and the match was called a draw. Now you may be wondering, isn’t this a story on “Assassinator”?? Yes it is, but to appreciate what she is I believe it’s important to understand what her father was. Before this last match, “Assassin 1″ was bred to a game pregnant dog from Ch.”Boze” and Ch.”Hog Dog”. Ch.”Boze” was a very good littermate to the very well-known Gr.Ch.”Miss Rage”. 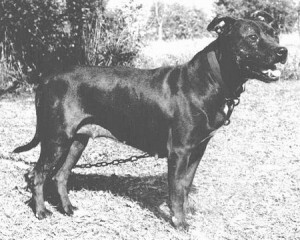 Ch.”Hog Dog” was a very well bred pregnant dog down from “Tramp Red Boy”, so this was line breeding on “Tramp Red Boy”. F.Jacobs kept “Assassinator” as his pick of the litter; she looked impressive in her schooling and was matched three times “off the chain”. She inherited much of the speed and ability of her father along with a considerable mouth. 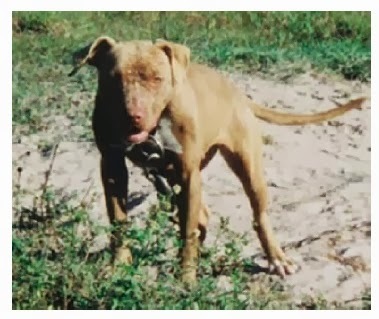 This may have been the result of a hybrid effect or come from her grandfather Ch.”Boze” as his line was noted for strong mouth. It was shortly after this that we first became involved with the “Assassin” dogs. 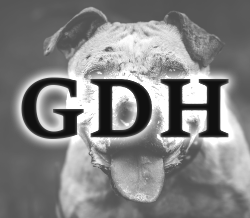 We had worked fairly close with Goodtimes in the past, he was one who always had an eye for a good line of dogs and always wanted to try some new blood. He talked me into taking a trip with him out to F.Jacobs’ place with the intention of picking up a couple of dogs from this line. We went out to South Carolina and came back with several dogs. A few showed promise so we talked to Jacobs about getting some more, Jacobs was looking to get out of the dogs at this time and offered to sell us “Assassinator”. We had seen her when we first went to his place but he would not discuss selling her at that time. Now he was willing to sell her bred to “Assassin 2”, I’ve no doubt that part of the reason he was willing to sell her was because he knew we would take good care of her. At the same time that we went to get “Assassinator” we went to the Carolina Kittens place and bought “Devil Deacon”, now an R.O.M. producer. While we liked “Assassin” blood we thought we needed some tight “Red Boy” blood to breed back to it to get the type of dog we wanted. 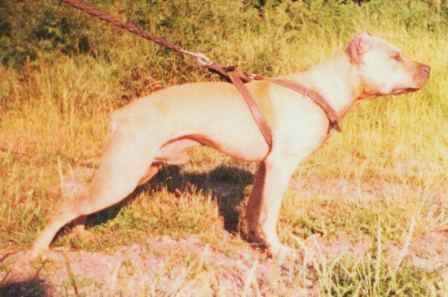 The first time “Assassinator” came into heat we bred her to Goodtimes’ “Josh”, a 2x winner and brother to Ch.”Sheena”, the pregnant dog that produced the “Spike” dog. He basically bred down from some old Corvino blood mixed with Ch.”Rascal” and “Buster” blood. “Josh” was an excellent dog and while this was pretty much a complete outcross, these turned out to be some very good dogs. The next time we bred “Assassinator” it was to “Deacon”. “Deacon” was checked out in an “off the chain” roll in such impressive fashion we turned down $5000.00 for him after the roll. “Assassinator” or “Nator” as we called her, gave us a litter of eleven pups and raised them all. It’s interesting that we had trouble selling them, probably because potential buyers didn’t really know about the “Assassin” dogs at that time. As a result we ended up keeping a large portion of the litter. This probably led to better management of the dogs from this litter than many other litters in that we were fairly careful to put them in the hands of good dogmen. From this litter came Ch.”Betty” a 3x winner and 2x Best In Show winner, (one of her wins was a one match show); Ch.”Becky” a 3x winner, all over top competition; Ch. “Doris”, DEADGAME in her third; Ch.”Ben Aid” a 3x winner, all his teeth were gone by the time he was shown for his first match. He was also DEADGAME in his last match. Besides these champions there was several other good dogs in this litter, Bart’s “Bea Bea” won and lost her third to DSK’s “Choo Choo”; “Crybaby” a very game 1x winner; “Keri” was very impressive in her schooling but was held back for brood; another pregnant dog lost all her teeth at a young age and was kept for brood; another male got off his chain at his owners; there was also two other males in this litter that quit. In all that litter eight of eleven showed GAME. Shortly after having this litter “Nator” developed a spinal problem that eventually led us to having to put her to sleep. A ruptured disc led to her rear legs being partially paralyzed. We had to put her to sleep in 1994, we had bred before her condition got really bad and had a litter of three that all died. Right to the end she was a very affectionate pregnant dog that we were all very fond of.